Well, I'm getting ready to ride Bike MS 2009 this coming weekend. It's not too late to donate to me, if you'd like. In fact, you can donate all the way up to October 30th. So, I was up late tonight working on getting my bike all ready since I won't have much time tomorrow (surgery day for my dear wife). 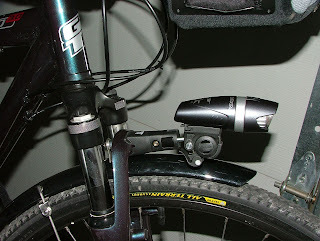 Though I love both my Planet Bike Blaze headlight and my Ortlieb Handlebar Bag, I'd been having a hard time trying to figure out how to mount it so the light would shine over the top of the bag. I bought a Topeak BarXtender, but it still wasn't long enough. Then, it came to me. I figured out a way to mount it to the top of the front fork. After a test run with zip ties, and a trip to the hardware store, here's the final result. 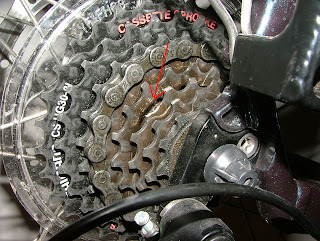 Instead of the metal clamp band, a long screw runs through the mounting piece and ultimately ends up holding on the fender, as well. It seems to work quite well - I'm pretty jazzed about it. GAH! This bike is NOT that old. Shouldn't be doing that. Going to call the bike shop once I get back.